AirNow offers daily AQI conditions for over 400 cities. AQI or Air Quality Index tells you how clean or polluted your outdoor air is. 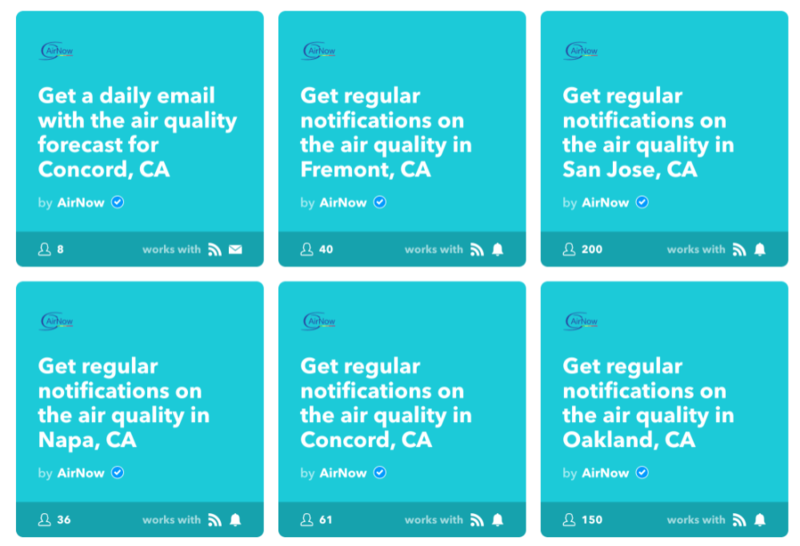 The organization has launched If This Then That (IFTTT) applets that will send you regular notifications on air quality in cities in the Bay Area. This comes especially handy with the ongoing wild fires happening in the North Bay. All you need to do is install the free mobile IFTTT app which is available for both iOS and Android. Then go to the AirNow applet page or simply search for AirNow and install the applet that corresponds to your city. Once you activate the applet, you will start to receive push notifications on the air quality in your area. It’s real simple to install and activate. Post a comment if you run into any trouble and I will try my best to help you get the app running. Next article Can you charge your phone with your body?